AES was originally formed in 1987 by the conceptual architects Tatiana Arzamasova and Lev Evzovich, and the multidisciplinary designer Evgeny Svyatsky. 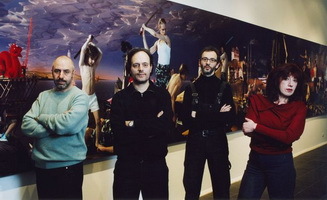 Vladimir Fridkes, a photographer, joined AES in 1995 and the Group changed its name to AES+F. AES+F’s recent work has developed at the intersection of photography, video and digital technologies. Deploying a sophisticated, poetic dialogue among these media, AES+F’s visual narratives explore the values, vices and conflicts of contemporary culture in the global sphere. AES+F achieved worldwide recognition and acclaim in the Russian Pavilion at the 52nd Biennale di Venezia in 2007 with their provocative, other-worldly Last Riot (2007), the first in a trio of large-scale, multichannel video installations of striking originality that have come to define both the AES+F aesthetic and the cutting edge of the medium’s capacities. The second of the series, The Feast of Trimalchio (2009), appeared in Venice in 2009, and the third, Allegoria Sacra (2011), debuted at the 4th Moscow Biennale in 2011. The images of Islamic Project debuted at the Guelman Gallery in Moscow as AES – Witnesses of the Future: Islamic Project in 1996, during the breakout of Chechen War, and served as a kind of psychoanalysis – a visualization of Western fears about Islam. In 1997, the group created an interactive performance titled AES Travel Agency to the Future – a fake travel agency office with souvenirs from an “Islamified” future, where visitors were asked to fill out a provocative questionnaire. The Islamic Project has been shown in Russia, the United States, South Korea, as well as in many European countries, and was met with an active and controversial reaction in the international press. After the attacks of September 11, the Islamic project was treated as prophetic, bringing it to wider popularity – images began to appear on the Internet, on posters of protesters in England, as anonymous cards in tourist kiosks of Mexico. The Islamic Project became widely known outside the art world. Nowadays, when ISIS is declaring its ambition to create a fundamentalist Muslim state (caliphate) across the globe – the Islamic Project has become a classic among anti-utopian visions.